What is a Mandoline Slicer? First things first - it is great value for money. Extremely easy to clean - no juicing screen in this juicer. Juices fruit, veg, leafy greens and wheatgrass. Made of tough material - Lexan Polycarbonate. Uses the tried and tested single auger design. Durable stainless steel auger tip and juicing cap. The patented suction base locks onto any smooth surface with a 45kg suction strength. Comes with 475ml collection bowl with graduated measurements. 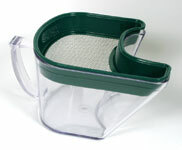 Supplied with a sieve to remove all pulp (if desired). Portable and lightweight - very suitable for travel - only 1.5kg. Compact and functional with locking tool doubling up as a food pusher. Comes with G-clamp for additional security for not so smooth surfaces. Extended handle for greater leverage. Michael Bergonzi ex Greenhouse manager at Hippocrates Health Institute claims this to be the best manual juicer he has ever used for wheatgrass juice. All materials used in the Farre Juicer are non-toxic and FDA approved. Used and acknowledged by juicing experts all over the world. The Farre Healthy Juicer has a suction base to secure it to a smooth surface and also a stainless steel clamp for extra grip. Securely attaches to any smooth kitchen counter or table. A stainless steel clamp is provided as an additional tool to secure the juicer to the table. And because the Farre healthy juicer requires no electricity, you do not have to worry about attaching electric cords or having motors or switches breaking. Best Value for money. The Farre Healthy Juicer is a 'slow' type juicer and does the same job as other expensive electric stone mill or cold press type juicers for a fraction of the cost of electrical juicers. It is ideal for that quick cup of fresh juice or wheatgrass. It is also an excellent choice (light and portable) for bringing along whilst camping or to a weekend holiday away from home. Quality Material. All parts of the juicer are made of tough Polycarbonate which is most durable. 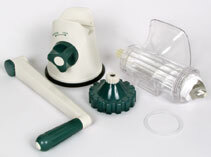 All materials used for the Farre juicer are FDA approved. The strong and lightweight handy manual juicer can give you living juice with your preferred fruit or vegetable...whereever you are. You can juice the following: All firm fruits, leafy greens and wheatgrass. Not very suitable for hard vegetables such as Carrots and Beetroot. The Farre Healthy Juicer is a quality unit that is highly recommended by Michael Bergonzi (ex greenhouse manager of Hippocrates Health Institute in Palm Beach, Florida, USA) who grew all the wheatgrass for the Institute and did a huge amount of demonstrating using the Farre Healthy Juicer (a.k.a. 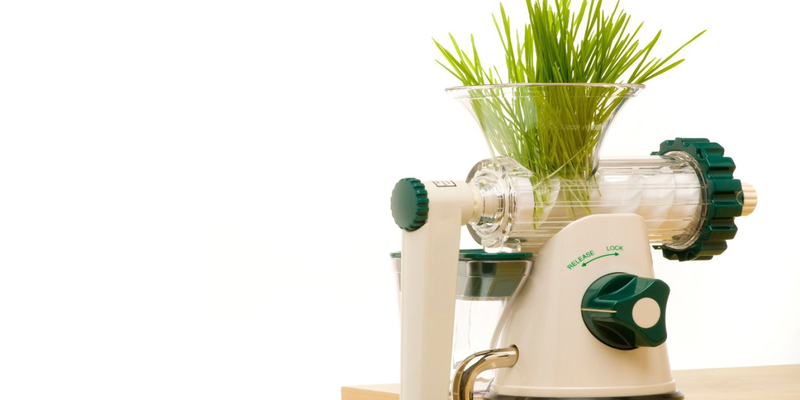 Lexen Healthy Juicer) recommending it as a superb manual juicer for wheatgrass. The Farre Healthy Juicer can also be used for other produce including fruit and hard vegetables. It is recommended that the wheatgrass blades be cut into pieces with a pair of scissors, and all other fruit and vegetables, especially the hard vegetables, be cut into smaller cubes. When operating this juicer, if you feel resistance it is important not to force through the resistance but rather to reverse the handle and remove the produce causing the obstruction. Note this equipment is not made of steel. The Farre Healthy Juicer is light and compact, ideal for travelling. 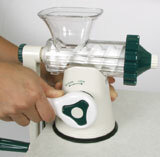 The Farre Healthy Juicer is not a replacement for an electric juicer such as the Oscar Juicer. It is not suitable for high production as it requires manual effort and does not produce comparable juice quantities, with the exception of wheatgrass. 1 year warranty for factory defects.